As 2017 draws to a close, I’d like to take this opportunity to look back on what learned this year. I spent the 2017 school year trying to develop a meaningful personal understanding of effective STEM teaching practice and projects, testing out some ideas and approaches in both collaborative and specialist teaching contexts. We ran some promising experiments with the use of robots to teach basic maths concepts (angles, measurement of distance) in the early years. I particularly enjoyed collaboratively teaching our first Junior FLL AQUA ADVENTURE season in Year 2. I also experimented with teaching marble runs (Year 4), cardboard automata (Year 5), and Scratch storytelling and game design (Years 5 and 6). Overall, I learned some positive lessons this year. Effective STEM projects are hands-on, collaborative, and underpinned by the design process. 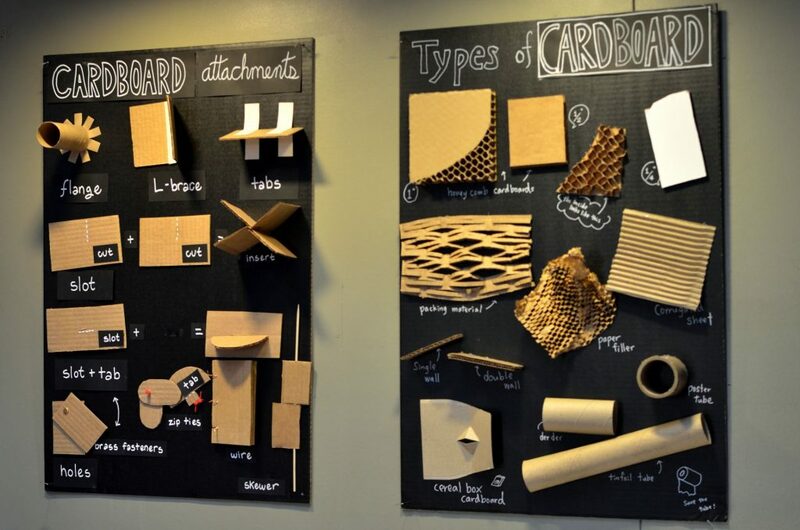 Students need time to tinker with ideas and materials, before applying their learning and conceptual understandings to design, build, and refine a solution to a problem. Specialist STEM rotations are a fantastic way to teach foundational Design/Digital Technologies concepts and skills, but for this to make a real difference, students need more opportunities to apply their learning in other curriculum areas – for example, providing students with the opportunities to explain Science concepts using a Scratch animation. Next year, I’d like to try and explore opportunities to better integrate my STEM and robotics projects with other curriculum areas. I am also keen to improve my teaching of design thinking and the design process. One of the highlights of my year was spending six weeks touring the USA, where I attended ISTE in San Antonio TX, ran a Scratch game design workshop in Chicago, and visited The Exploratorium in San Francisco. This trip was a priceless opportunity to visit friends old and new, and my visits to one of the world’s greatest science discovery museums in San Francisco were particularly valuable. I had the pleasure of meeting Karen Wilkinson, the Director of the Tinkering Studio, and touring their work and tinkering space. 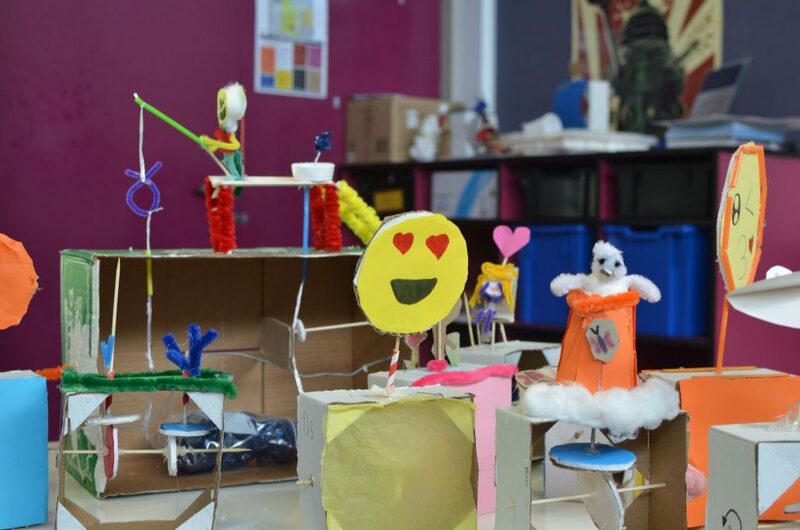 The Tinkering Studio felt like the spiritual home of the maker movement, and their book – The Art of Tinkering inspired our experimentation with Cardboard Automata (mechanical toys), marble runs, fused plastic fabrics, and marble runs when I returned home. 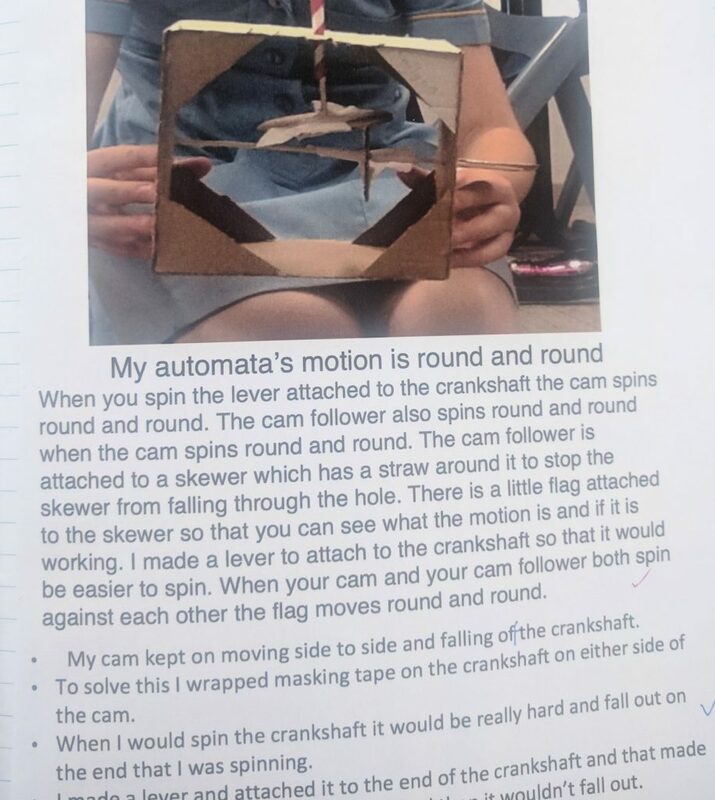 The Automata project was one of the hardest yet most rewarding STEM projects I have facilitated to date, resulting in a significant growth in students’ understanding of mechanical principles and the design process. 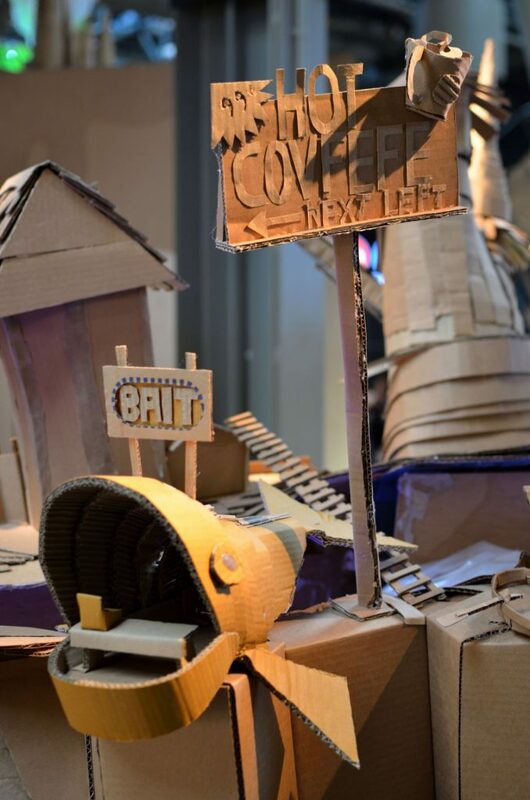 I was also fascinated by the major Cardboard sculpture exhibition in The Exploratorium, and I hope to explore the possibilities of guided, large-scale cardboard construction in 2018. From March to August 2017, I helped coach two former students through their first RoboCup Junior Dance competition. One of the best aspects of RoboCup Junior is its emphasis on the learning process, especially its recommendation that participants maintain a robot design journal or engineering log. This journal, while not compulsory, proved to be one of the best things we ever did, and the girls went on to win Second Place Secondary Dance at the WA State Tournament. Build your own robots – not something you’ve found in a book. You learn so much more this way. Remember to have FUN! (Even when your team drops and destroys the robot an hour before the practice tournament). Tournaments are fantastic networking and learning opportunities for the children (as well as the coaches). The more time they spend talking to and sharing ideas with other teams, the better. In the latter half of the year, my life felt like it revolved around preparations for the FIRST LEGO League “Hydrodynamics” season. 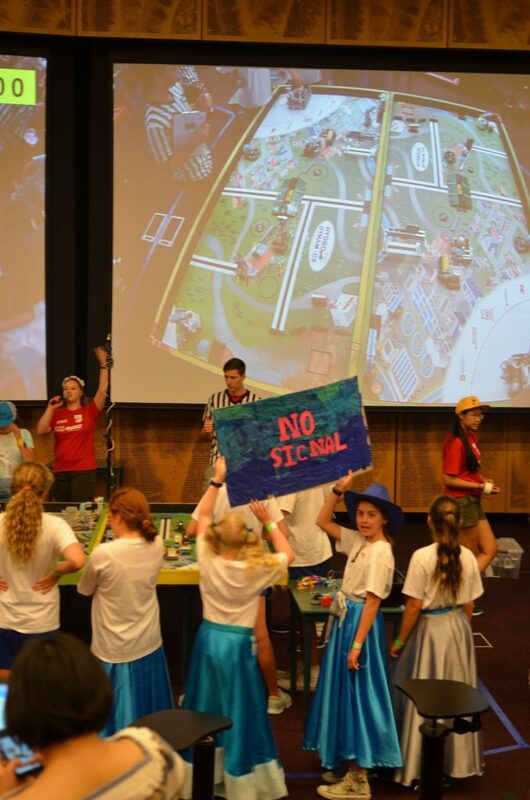 In our second season, we once again fielded two teams – “No Signal” and the “Robotic Rebels”. Our goals for this season were to improve our robot design, engineering documentation, and raise the standard of our project research and solution. 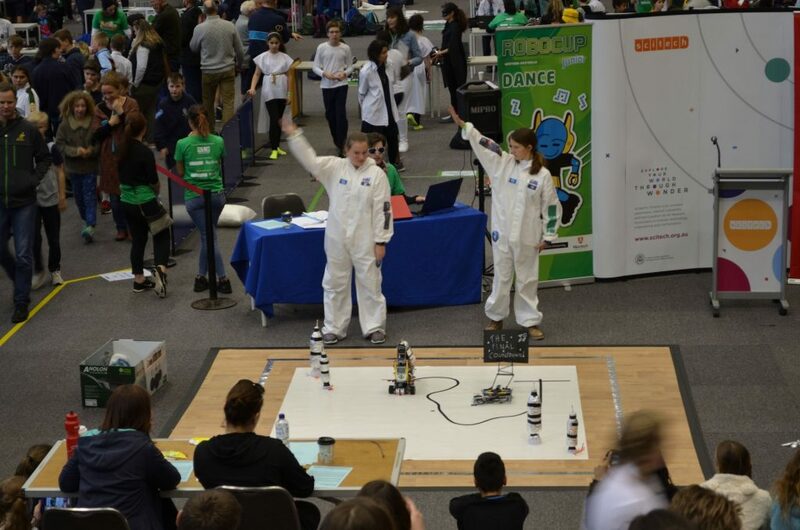 We invested more hours (mostly on weekends) than I’d care to admit, and while our robot games were a demoralizing disaster, the girls performed remarkably well overall. One team won the Project Presentation Award, and the other, against all expectations, won the Regional Championship Award. We flew to Sydney in early December for the National Tournament – which was an eye-opening learning experience. 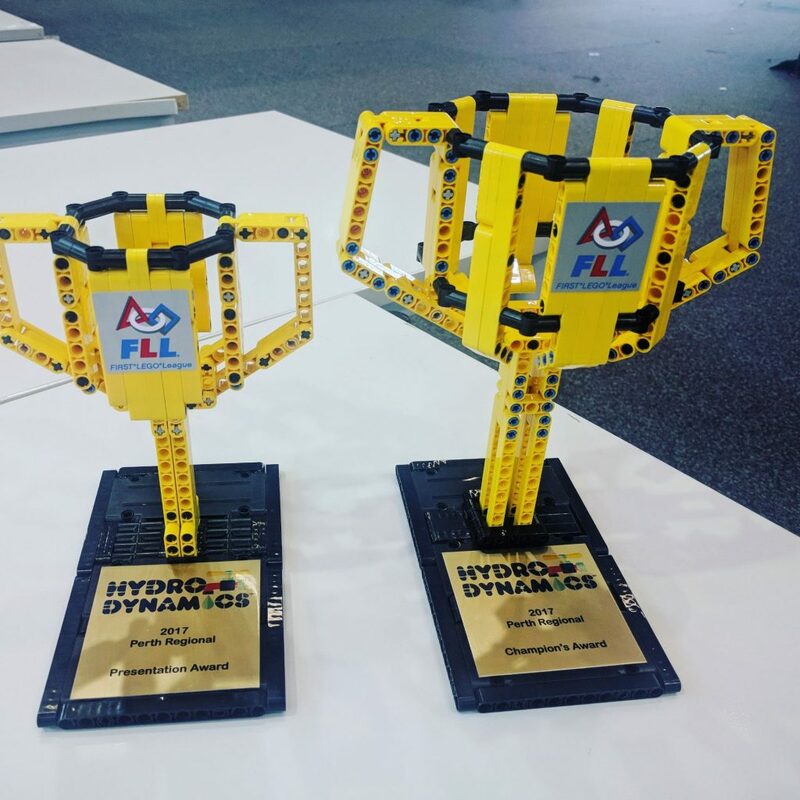 The Hydrodynamics FLL season is one that I will remember for many years to come, and not just because we brought home some really nice LEGO trophies. I’ll remember it for the girls I coached, and the lessons we learned during the course of the season. Perhaps the most significant of these is that the FLL Core Values matter. In my estimation, we fielded two of the top 5 teams in our regional tournament, but the one which qualified for the national competition was the team which fully embraced, and communicated their experience with the FLL core values. During the year, and especially in the first few weeks of the season, these girls seriously struggled to work together, let alone be kind to each other. We did a few core values activities, had a few rather blunt conversations about teamwork … and gradually, I saw signs of real change. It was extraordinary to watch their transformation over the course of the season. It was an insight into the true spirit of FLL, and one which I will treasure. While we made significant strides in our engineering documentation and robot design, consistent robot performance was a major issue. At nationals, we learned to use a minimum of two sensors at all times, with the wall being a sensor. While we were making extensive use of wall squaring and line align techniques, differences in the competition table contributed to inconsistent robot performance. Using a touch sensor to confirm we had hit the wall would have been helpful. At nationals, we were lucky enough to receive a masterclass in advanced robot and attachment design from Project Bucephalus, one of the best teams in Australia. We were really intrigued by the possibilities of having a small base robot and large-scale attachments which could complete multiple missions in one run. This is something we will endeavour to explore further next year. We made fantastic improvements in the project research component, but designing innovative solutions to the problems is something we will work on next year. We have started teaching design thinking skills this year – and hopefully, the girls will be better prepared for this component by the time we start our 2018 season. So, in closing, I’d like to dedicate this post to the amazing children I taught this year, especially my Scratch addicts and my FLL robotics girls. Your passion, and willingness to share your learning with your peers and myself gave me a reason to push through and try out new ideas. I’d also like to thank for my (now former) Principal, who inspired me through her words and actions to become a better teacher. In a year of massive change within our school community, your example and leadership were greatly appreciated. While there are more significant changes on the horizon, I hope 2018 will be a better year. 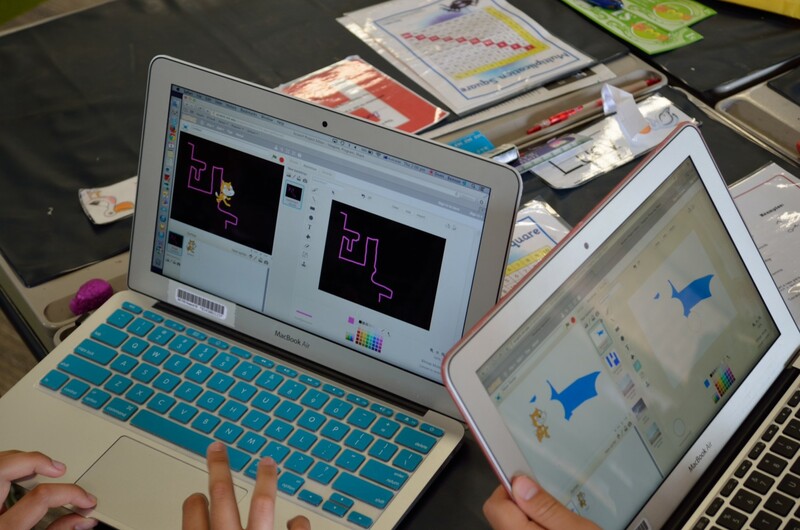 Over the course of the 2017 school year, my approach to teaching Scratch changed dramatically as I came to better understand how to support my girls’ learning and engagement with Scratch visual programming. As I have previously explored here and here, my students thrive on challenging, authentic visual programming tasks which focus on storytelling and game design. One of my professional learning goals this year was to bring my students’ up to the year level C standard for visual programming, assessed against the WA version of the Digital Technologies Curriculum. I also set out to develop a scope and sequence of Scratch skills and assessment tasks for each year level. We made a great deal of progress, although at times, I felt like a victim of my own succcess. 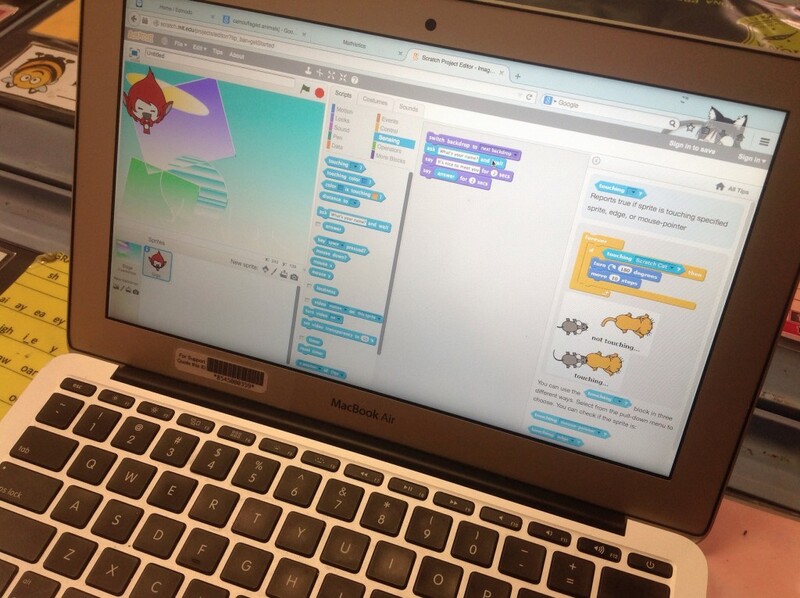 In addition to our classroom projects, it was not uncommon for students to spend many happy hours in their own time exploring and building Scratch projects of all kinds. In addition, my lunchtime Scratch club proved to be so incredibly popular that I had to split it across two sessions due to overwhelming demand. So, as the year draws to a close, I thought I might share what I’ve learned, and take this opportunity showcase my students’ learning and creativity in Scratch. Various storytelling and simple animation projects using Scratch Junior on iPads. Scratch 3.0, to be released sometime next year, will no longer require Flash, and will be iPad friendly. I can’t wait to use it with my students! Explicitly teach how to use the arrow keys to make sprites move, eg. through a maze. Explicitly teach how to use coordinate position to control sprites location on the screen, and arrow key movements (up/down, left/right). 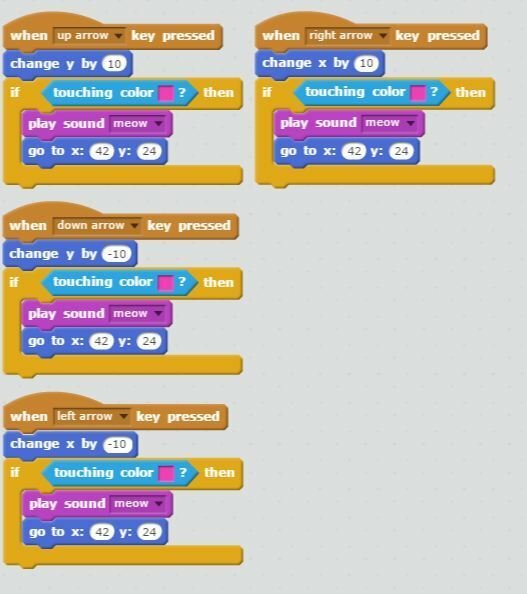 Explicitly teach how to use Broadcast and Receive blocks (better to do here than in Year 6). Explicitly teach how to use sense, IF/THEN, and operator blocks to create quizzes, games, and stories which require user input through the use of clickable buttons and text entry – catering for multiple possible answers. Explicitly teach use of Pen and Data (variable) blocks. I created a Scratch game design website for my ISTE presentation in June. Please take the time to explore, and feel free to share it with your networks – http://bit.ly/scratchgamedesign17. Scratch now has Education accounts, allowing teachers to create user accounts for their students without the need for email addresses. We created Scratch accounts for our students based on their anonymised usernames for another site and taught them how to protect their online identity when participating in the online Scratch community. Despite one or two teachable moments, overall our girls really appreciated receiving constructive feedback from other Scratchers – both within and beyond their school. While our experience with managed student accounts was broadly positive, they are a nightmare to manage and transfer at the end of the school year. If I were to create student accounts over again, I’d create Scratch classes for each Year/Grade Level – e.g. Year 5 2017. At the end of the year, the class can then be renamed, and new students added. Students are taught to add their projects to Scratch Studios, although I will need to think through a proper naming convention for these as well – as they are visible to all students in our school. It has taken me nearly two and a half years, but I finally feel like I am starting to understand Scratch and how to teach it in a way which is accessible to students with a range of experience and confidence with visual programming. It was wonderful to see students achieve success with Scratch, even if it took some of them considerably more time and help to start realising its’ potential. I am indebted to my early adopter students for both showing me what is possible with this programming platform, and for helping teach their peers and teachers. The power of peer teaching, and the wealth of tutorials available on YouTube and Scratch Online are not to be underestimated! A photo with my Principal, a passionate advocate for our makerspace and robotics program. A few weeks ago, my library colleague and I accepted, on behalf of our school, a prestigious Catholic Education WA LEAD Award for Excellence in Learning. 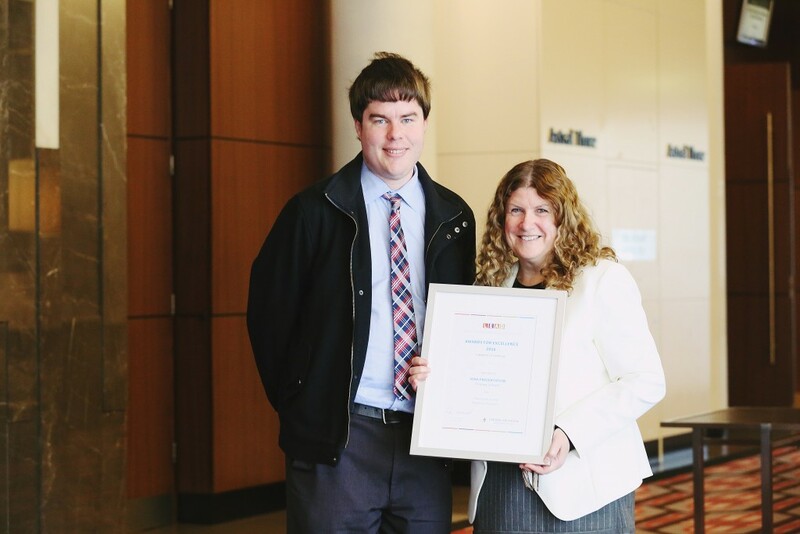 This award recognized our work in establishing our school’s makerspace and robotics program, which includes a research partnership with the Schools of Education and Engineering at Curtin University. Unfortunately, due to a family emergency, my library colleague was unable to attend the awards event. Working in a girls’ school, we are primarily focused on engaging and empowering our students’ interests in digital technologies and engineering. 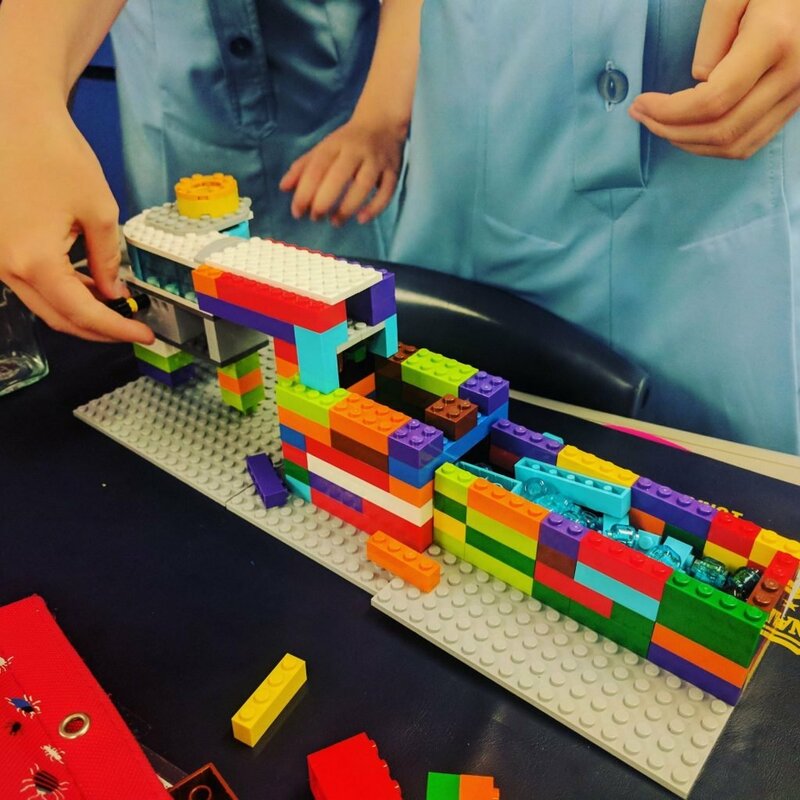 After setting up our library makerspace late last year, we were introduced to several researchers at Curtin University, who were interested in researching the impact of makerspace projects on girls’ engagement with Science, Technologies, Engineering, and Mathematics. As a result of this connection, we have hosted several “STEM makerspace workshops”, facilitated by pre-service teachers and engineering students. Earlier this year, we created our after school “Maker Monday” program, run in the school library, which provides interested students with the time and space to pursue design and engineering projects – going beyond tinkering with electronics and robots. At the start of 2016, I also established our competitive LEGO robotics program. As you can probably imagine, it has been a rather busy year! Our makerspace and robotics program is very much in its’ infancy, but our curiosity, risk taking, and experimentation are beginning to have a real, positive impact on our students’ learning and engagement with digital technologies. We know we have a lot to learn, and we have a long way to go before what we can meaningfully integrate the makerspace philosophy and pedagogical approach across our school. We are indebted to our school leadership team, both past and present, for without their support these projects would never have happened. Having our work acknowledged by our system as an example of innovation and excellence in learning means a great deal, and it is a huge confidence boost as we continue on what has been a challenging, but ultimately very rewarding, teaching and learning journey. As schools around Australia prepare for the implementation of the new Digital Technologies curriculum, teachers are starting to come to terms with some difficult new terminology, content, and skills. 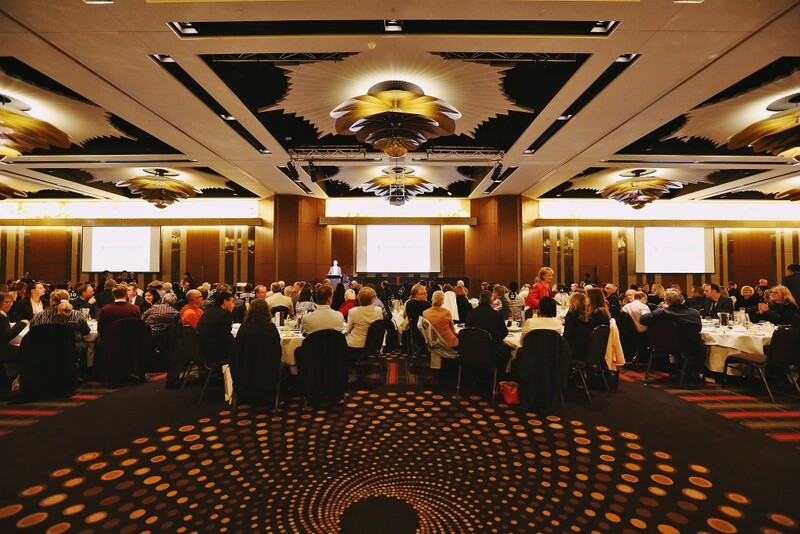 While Western Australian schools have been given two years to implement a slightly more user friendly version of the national Digital Technologies Curriculum, we are facing a number of significant challenges in common with our interstate counterparts. There is a common misconception that ICT and Digital Technologies are the same, and teachers who haven’t read the curriculum are in for a shock. While ICT focuses on the use of technology for learning, Digital Technologies focuses on empowering students to be creators, producers, and developers of technologies through the development of computational thinking. For example, students use ICT skills when they make movies, podcasts, and digital stories. 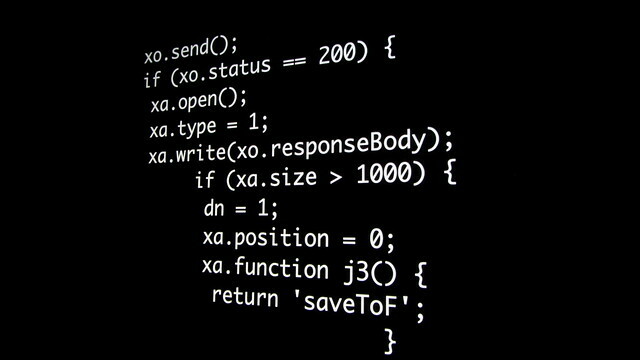 They develop understandings of digital technologies when, for example, they explore the role of hardware and software in their smartphones; and when they use computational thinking to code digital solutions to problems – e..g. programming a robot. A good way of defining the difference is comparing ICT General Capabilities to Literacy Skills, and Digital Technologies to the English learning area. Challenge 2: To integrate, or isolate, that is the question. At the start of 2015, we introduced major changes at my school. In line with the purpose and goals of the ICT General Capabilities in the Australian Curriculum, classroom teachers became responsible for integrating ICT across the curriculum. There were two reasons for this change. Firstly, we believed that learning with ICT should not be isolated in the computer lab, segregated from the rest of the curriculum. Secondly, building our school’s reputation for high-quality ICT and digital technologies programs will rely on the expertise of every member of the school community, from the Principal down. Can schools really afford to reply on one expert? What happens when they leave …? In our school, many teachers are exploring the power and relevance of ICT and digital technologies to their classroom teaching. I’ve watched teachers become the most excited learners in the room, empowering their students’ creativity and problem solving through digital storytelling, coding, and robotics – and starting to see authentic connections to maths and literacy. My coaching experiences this year, and discussions with teachers (through Twitter and ISTE), raises an important question in regards to the implementation of the Digital Technologies curriculum. What is the point of teaching students to collaborate, think computationally, and solve real world problems in one lesson a week outside of everyday classroom learning? Yes, this may be appropriate for a technologies extension program, but surely these skills are important and applicable for all students, across a range of learning areas? The implementation and integration of the Digital Technologies curriculum will be a steep learning curve for most teachers. Some of the concepts in the new curriculum are scarily new, especially the parts about binary language and coding. Yet, others are familiar. For example, we use algorithms for problem solving, cooking, and giving directions / instructions in English , Science, and Maths. We use spreadsheets for collecting and making sense of data in Maths and Geography. These learning activities provide an authentic, relevant context for the integration of digital technologies. 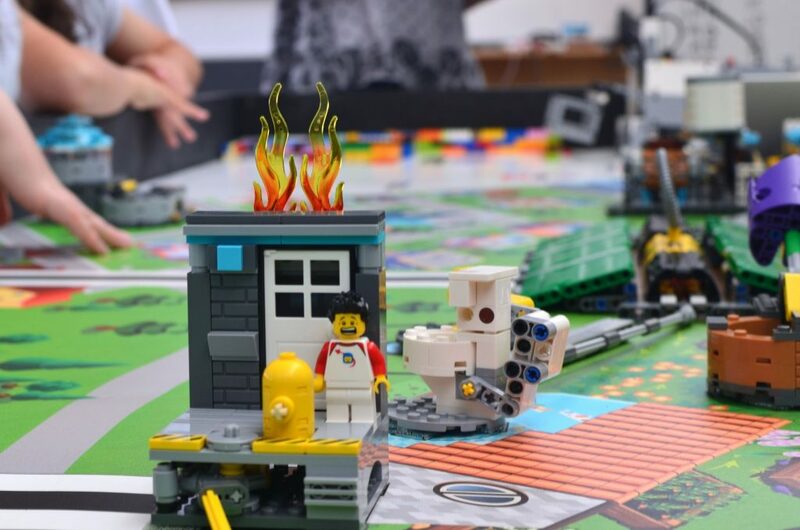 As indicated by the WA curriculum writers, it makes sense to integrate Digital Technologies at the primary level – both through classroom learning activities, and through your library makerspace (if you are lucky enough to have one). If we learned anything from last year; however, it is that teachers are going to need a lot of support, both through collaborative PLCs and resourcing, to become comfortable teaching this new curriculum. At my school, I have been working as a part-time teacher coach, supporting teachers’ integration of ICT and digital technologies in the classroom. This approach is most empowering for those teachers seeking help to develop their relatively limited technology skills, and those keen to push pedagogical and technological boundaries. I know that most schools can’t afford to fund this kind of role, but I would suggest that teacher relief for collaborative planning, classroom observation, and targeted professional development in Digital Technologies would be money well spent. I’d start by developing the skills and capabilities of a small group of interested teachers across a range of year levels, and then giving them time and space to share their learning with their colleagues. I am hoping to do this in my own school this year – it is just too hard to lead this change process alone. Challenge 4: Finding resources and fellow pathfinders. As we begin our Digital Technologies journey, I take a great deal of comfort in the knowledge that we’re not alone. Around the country, and around the world, teachers are developing resources, activities, and tools that we can adapt for use in our school. As schools begin their familiarisation and planning with the Digital Technologies Curriculum, it is important to consider what tools and resources they already have available, e.g. iPads; and plan for strategic investment in edtech tools which add value to the curriculum, such as BeeBots, Dash (Wonder Workshop), Sphero, and MakeyMakey. I’d add LEGO EV3 robotics if you can afford them! If you’re interested in developing your understanding of the curriculum, or if like me, you’ve been tasked with leading its implementation, I’d highly recommend connecting with your local ICT subject association, joining Twitter, and exploring the CSER Digital Technologies MOOC. With the rest of Australia (except NSW) implementing this change from 2017 (2018 in WA), things are about to get really interesting! I’m learning as I go, and I don’t have all the answers. Leading the familiarisation and implementation of the new Digital Technologies Curriculum in my school is probably the biggest challenge I’ve faced in my career to date; and I’ve learned some valuable lessons. You don’t need to have all the answers when you’re starting out. If you can develop a basic understanding of the concepts and tools, don’t be afraid to learn and experiment alongside your students. It took me months to overcome my fear of learning in front of my students and colleagues, but I soon discovered that the more I threw at our girls, the more they came back and surprised me.. Leading curriculum change isn’t easy, but its worth fighting for. You will treasure those little moments … Watching a girl who struggles in class successfully code a robot for the first time . Noticing that a group of students have continued the Hour of Code 2015 activities independently through their Christmas holidays. 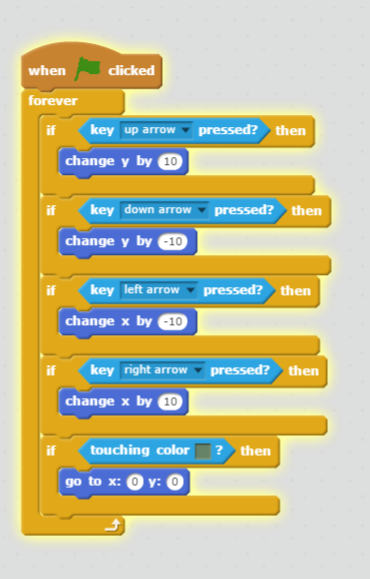 That time I sat down with a Year 5 student and asked her how to explain how she did things I didn’t know were possible with Scratch. At the end of the day, my students are the reason I teach. In March 2015, I wrote about an iPad digital storytelling app that was beginning to have a transformational impact on my teaching practice. At the time of writing, I wasn’t aware just how big an impact it was going to have on my Early Childhood colleagues’ practice as well. Over the course of the year, our teachers and students in PP, Year 2, and Year 3 used Adobe Voice extensively, across a range of learning areas. I love Adobe Voice for its simplicity, and especially how it makes it so easy to find Creative Commons / Public Domain images and backing soundtracks. Our students love it because of its ease of use, especially in pairs (they take it in turns to record a slide). I wrote extensively about our pedagogical approach and suggested teaching strategies in March, and on The iPad Creative Challenge wiki, so I won’t rehash those comments here. 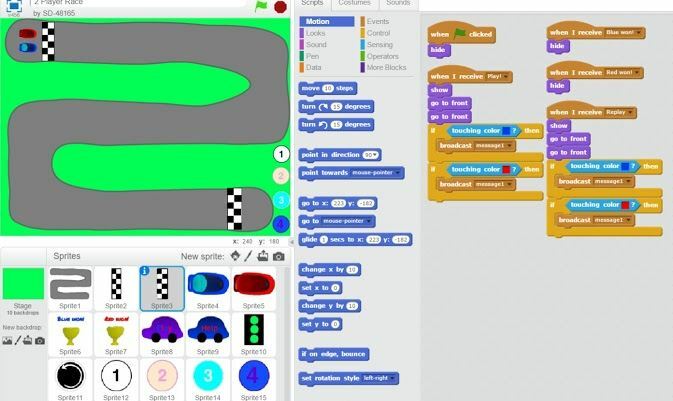 Jenny Ashby @jjash may not know it, but her Sydney #slide2learn session on Beebots and coding gave me the push I needed to take a risk, and experiment with Scratch programming in Years 4 and 5 in late 2014. Openly acknowledging in class that I had next to no idea of how Scratch worked, and what it could do, I set my students a challenge to create a game, or tell a story. With the help of YouTube tutorials, older siblings, and coding enthusiasts amongst their classmates, the girls merrily set to work planning, problem solving, and coding their projects; and they were only too happy to teach me in the process! Use Scratch to tell a simple story which includes at least one talking character (sprite), and at least two settings or backgrounds. Create a simple game where the user or player has to choose a key on their keyboard to make the sprite move or perform an action. This game could be a maze, a guessing game, or your own idea. It needs to include at least one Sprite (object/character), and a background. Storyboarded what my story / game will look like, and what will happen. Used code blocks to require user/player action – e.g. IF the player clicks their mouse or presses the A key, THEN …. Press ‘s’ to start, then use arrow keys as per in-game instructions. Press the following keys to progress the dialogue: a, c, e, r, q. Start by clicking on the green flag. Click on the green flag to start, then use your arrow keys to navigate. 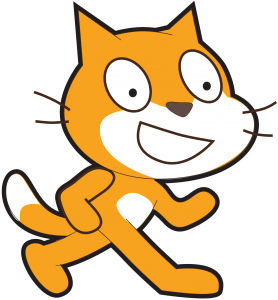 Introducing Scratch programming to my students was a huge professional risk, as to the best of my knowledge, it had not been formally taught at the school before. It was also the first time I had ever attempted to run a coding/programming project, something which I wouldn’t have dreamed of trying before #slide2learn. Through this project, I learnt a great deal about the power of play – allowing students to explore, experiment, tinker, and collaboratively solve problems as they pursued their coding projects. I was surprised by the level of student engagement – both in, and outside of class. Many went home to ask their older brothers and sisters for help and advice in coding their projects! I was also really impressed with the power of peer teaching and support in class, as we even brought some Year 4 students into a Year 5 class to explain how they used a particular Scratch tool ! Next time I run this, I intend to more formally stress the need the storyboard and planning aspect of the project, and include some higher level coding skills in the assessment criteria (drawing upon the Australian Digital Technologies Curriculum). I’d also like to try and provide better summative feedback to students, beyond the whole class discussion and reflection sessions we ran last year. The peer teaching and problem solving approach worked very well for most students, encouraging them to think and learn from eachother. Later in 2015, I am hoping to introduce Beebots and coding apps into Early Childhood maths / procedural writing, and explore how to integrate Scratch programming into other learning areas in upper primary. We are at the very early stages of teaching coding / programming at our school, but I am very curious to see where this little experiment takes us over the next few years. As I look back over the past six months, one teaching and learning experience stands out as a true highlight – the Year 3 iMovie Book Trailer Project, which was developed and brought to life by the amazing students of Year 3B, and their wonderful teacher. This project was run in Term 3, 2014 as a team-teaching project over six weeks, with roughly 90 minutes (2 lessons) each week. Neither the classroom teacher or I had ever done anything quite like this before, so it was very much a collaborative learning experience – and not just for the students! 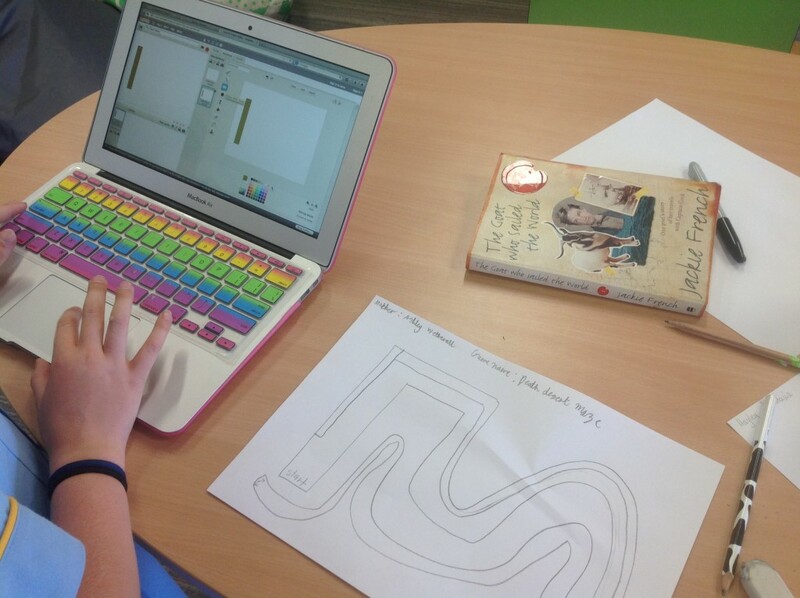 Students worked in small group “book clubs”, choosing their favourite book from the Australian Children’s Book Awards Shortlist for 2014. They worked to identify the main events of the story, holding detailed discussions about the book as they set about creating visual storyboards. When we started this project, we weren’t sure if we’d have students’ filming scenes from the books, or using Creative Commons/Public Domain images off the Internet. We eventually decided to go with the (somewhat) easier option – filming. Prior to formally filming book trailer scenes, we gave students time to simply play with the iPad camera, Photos, and iMovie app, discovering how they all worked. The stage was set for one of the most intense, but rewarding teaching experiences I’ve ever been a part of. On filming day, I knew we were in ‘trouble’ when I discovered a group of students setting up with piles of cardboard boxes in the library – before school had even started! Students brought in costumes and props, and set to work filming their scenes. This proved to be a fascinating process for us as teachers, as we noticed some groups found it much easier to work with each-other than others. We tried to maintain a hands-off, over the shoulder approach, and let the students work through the creative process relatively independently; however, we did have to step in with one group on several occasions. We weren’t overly sure how many lessons we’d need, and eventually spent about three (very intensive) hours in total. Our students blew us away with their passion, creativity, and sheer enthusiasm; and the videos they produced were of exceptionally high quality. Unfortunately, I didn’t have time to ask for parental permission to share them on my personal blog, and I ran out of time to put them on the school website! Next year, that won’t be such an issue, as student publishing will be one of our major whole-school ICT focus areas. It was a pleasure to work with Michael on this Book Trailer project. His excitement was shared by the children and myself. I came to the table with little experience so he was involving me in the learning process along with the children. With his guidance the main elements were discussed as a whole and then the children were encouraged to play and experiment. Other Book Trailers were critiqued by the children, the children became confident critics and through the process the children developed an eye and an understanding for what was required to produce a powerful and successful Trailer. The children were supported with their learning at all times by Michael as he moved with ease from one group’s individual need to another. Michael allowed the children to be creative and encouraged them to solve problem themselves learning from each other. The parents were impressed with their children’s enthusiasm for the Book Trailer project. Some children asked to have a permission note for their parents, to allow them to come to school early so they could get started on their filming. The project was then able to be viewed by all parents during Open Night. It was a huge success where we got to how learning became fun and effortless for all involved. The children came into this project with no experience with this type of technology or using iPads in a collaborative project. The children chose to be in a group that they had a common interest, the interest was their favourite book from the Book Week nominations. As a result group sizes were varied along with a variation in literacy ability. This could have been very challenging for most teachers but through this project I believe we got the most from all our children. They are looking forward to the next project with Michael. As I look back at this project, I am immensely proud of what we achieved in a relatively short space of time. I was blessed to work with a gifted, enthusiastic classroom teacher who was prepared to take risks, letting the students take the lead in their learning. We were able to forge a close working relationship, building on our respective strengths and expertise to enable our students to create something special. I’m very much looking forward to seeing what we can do together next year! Many students, and many teachers, are unaware of, or not completely informed about how copyright law works online, and most have never heard of Creative Commons or Public Domain media. Yet, these concepts are critical to developing understandings of digital citizenship, and form part of the ICT General Capabilities in the Australian Curriculum. As part of my classroom program, I designed this presentation to clarify some of the key issues, and developed a reference list for PD/CC sites suitable for use in middle to upper primary. Creative Commons and copyright awareness is one of my ICT priorities for 2015. These infographics are quite handy for explaining the difference, and I have personally used the Creative Commons one in upper primary classes. Infographic: “Creative Commons – What does it mean?” (by Martin Missfeldt / Bildersuche.org). Faced with the challenge of respecting copyright in their work, two groups of Year 4 students excelled themselves in thinking outside the box, creating their own images for their iMovie book trailers. For some other excellent copyright friendly iMovie examples, please see my recent post “Lessons learn working with iMovie in Upper Primary“.